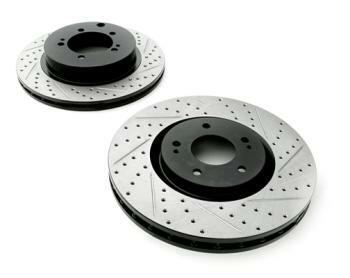 Rotora Brake Rotors - Drilled & Slotted - Dezod Motorsports Inc - Home of the automotive performance enthusiast since 2002. Drilled & Slotted Disc: Segmented radius drill & slot pattern for improved pad grip and reduce noise. Cleans away debris between pad and disc. Ensures heat and gas dissipation. For street and light track use, drilled & slotted is preferred.